Deepika Padukone’s Twitter rage over Times Of India video is disturbing. Not because she roared. Salutes to her! Well said! It is so because it is making News. Social media is on a roll… all and sundry slamming ToI, praising the actress’ courage and discussing media ethics and women’s empowerment. Well, during these last few days, another woman has been on the internet. 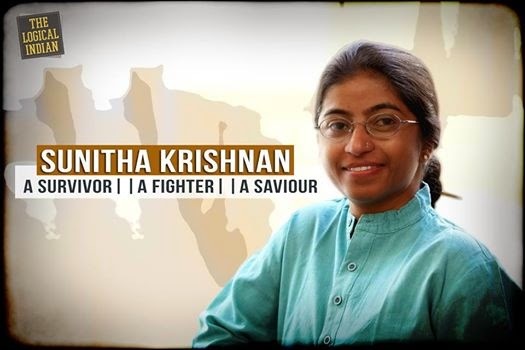 Dr Sunitha Krishnan – co-founder of Prajwala and an anti-trafficking activist. She was gang raped as a teenager that has left her partially handicapped. She not only survived the dark days but is living in style. A style that defies glamour and hoopla. She has dedicated her life to ensure no other girl suffers her fate! Now she is selected as one of the five finalists for the prestigious “Nelson Mandela – Graca Machel Innovation Award 2014. The news is on the very same social media that’s rallying for Ms Padukone. Dr Sunitha needs her countrymen’s and women’s votes to win. Her FB page [as of writing this] has just 3,401 likes. The link I shared on my page requesting my virtual friends to vote has just 9 likes and one re-share. Am sure, Dr Sunitha wouldn’t care about winning. But as a citizen and a woman, in particular, it hurts. It hurts to see that the nation rallies for a star’s cleavage rather than a laywoman’s courage! Continuing on the social media clamour…I happened to see another post comparing Mary Com and Priyanka Chopra, followed by a plethora of comments on how “one is fake and the other original”; ‘Only fake sells in India”… [To those uninitiated: Priyanka Chopra is an actress who essayed the role of Mary Com in her biopic]. This time around our virtual friends are sympathizing with Mary Com – the sportswoman – and slamming Ms Chopra. Here its money and fame that’s rubbing salt. Each single one of them forgetting that both the women are just living their passion, their dream. On the same note, let me mention another woman-related social media News that made headlines last week. 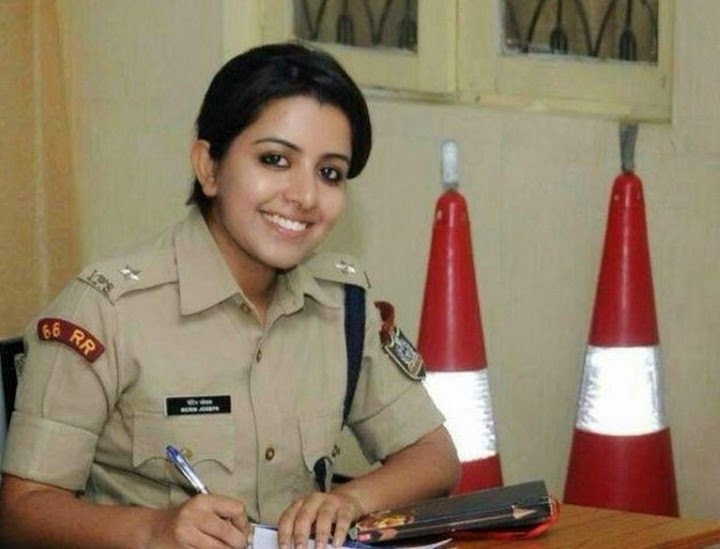 An IPS trainee officer Merin Joseph went viral on the internet because of her beauty. Following a rumour that she has taken over as the ACP of Kochi, virtual friends confessed that they wouldn’t mind being arrested by her. Phew! Her FB page [as of writing this] has 48,437 likes already…and counting! Just one reminder: The social media reactions to the above women were not all male-exclusive! A life-changing week… In gratitude! have been following all these stories since they came up, even the Kochi 'ACP' one… it is a really sad state of affairs. i felt sad reading up on Mary Kom's financial level compared to Priyanka's and I even read Priyanka's 'justification' and it just did not gel with me..
the disparity is so huge that it is demoralising for those working hard. Last night, the nursing staff in my hospital were really feeling bad – they had just read somewhere that Hrithik gets 50 crores for the Mohenjadaro movie… these are hardworking staff who put in 12 hours a day and end up getting 8,000 to feed their family after risking their health and dealing with all sorts of patients. I felt so bad for them… didnt know what to say? How can we justify some of this is beyond me.. It is really a very sad state of affair. We are attracted by glamour and look down upon, who really matter. Voted. I loved her TED talk video… so inspiring that it gave me goosebumps. The disparity in our country is depressing. But as you said all these women have worked their way up. The difference when it comes to wealth and popularity is really sad. I feel it is a reflection of our hypocrite society. Not just India but world wide. Agree with Naba here. I do not grudge what Priyanka has. But do mind that people like Mary Kom do not get the appreciation they deserve. Off to vote now.